Today on this, the fourth Sunday in Advent ~ the Sunday of Love, or Revelation, of Fulfillment or of Birthing, we light the fourth candle. The light grows and overcomes darkness on this winter solstice, the shortest day and longest night of the year. We live in dark times, when stories of despicable events fill the news and horrors are shared in our social media and evil things fill our minds and hearts with anxiety and fear. As we watch the world around us descend into darkness, we are reminded at Christmas that Jesus the Christ comes, a gift of love bringing light and life to all who receive him. Melody, please e-mail me (My e-mail address can be found in the column on the right just below the Google Badge) your full name and mailing address so that I may mail the pincushion to you! 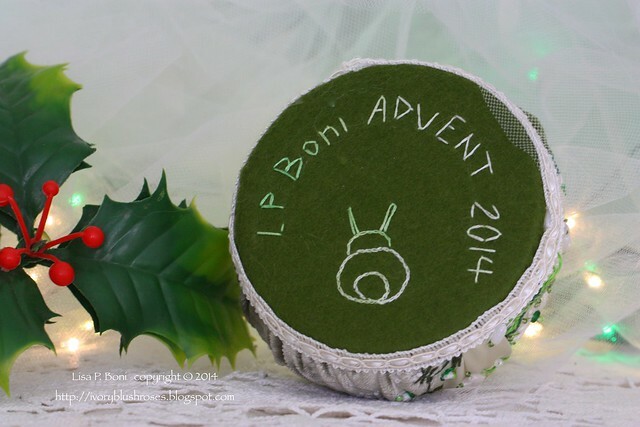 To enter the drawing for the Fourth Advent pincushion, leave one comment on this post before midnight on Christmas Eve, mountain standard time. I will then number the entries, removing comments from those who have won previously as well as multiple entries from the same person. A random number generator will be used to choose the winner and a runner up in event that the winner does not respond in a timely manner (1 week) with their mailing information. The winner will be announced on Christmas Day! 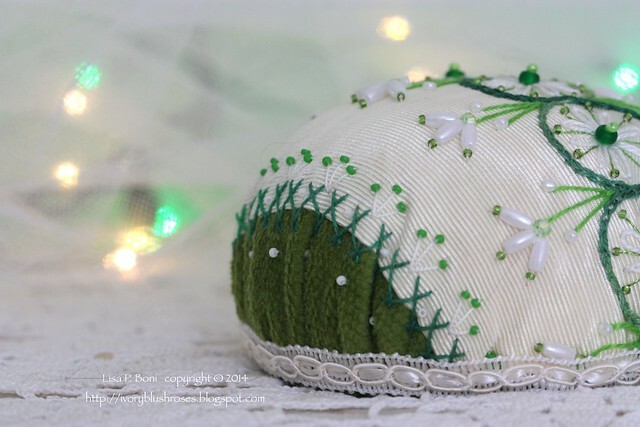 For this last Advent pincushion, I had no particular theme in mind, but simply stitched as inspired in my favorite combination of green and white. Wishing you and all of yours, a Blessed and Joyful Christmas! Definitely words to live by - thank you for the remind of the whole reason for the season. I love the colours of this design, especially the blend of greens against the silver. Just lovely...Merry Christmas, and blessings for this week of advent. I Definately have to make one of those lovely pin cushions myself! Yours are lovely! These pin cushions are beautiful. Earlier this year I received my nigh ore button collection which was already sorted into jars. I intend to crazy quilt the lids and your pin cushions are just the right ideas! Simply beautiful! All of it! Thank you for sharing your words about Christ, and sharing all the beauty you create. I am sitting here watching the "Sound of Music", one of my all time favorites. I love your work, but then I know I have said that many times, but your work brings so much joy to everyone who sees it. Thank you for sharing so much beauty Lisa. God Bless you and yours, and have a Blessed Christmas. 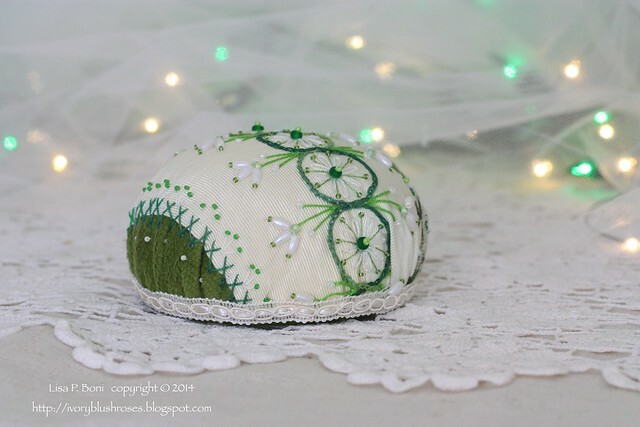 I found your blog a couple of months ago and cannot tell you how much I love your pincushions! They're such a beautiful way to finish a small project. Can't wait to see next year's projects. Wishing you peace and jot this Christmas season. Your pinchusion is beautiful. The words you quote are inspiring. My father passed away at Christmas a number of years ago and I still miss him terribly. I know we will meet again and that give me solace. Have a very blessed Christmas. Your work is so beautiful. You are inspiring. Would love to win this beautiful piece. 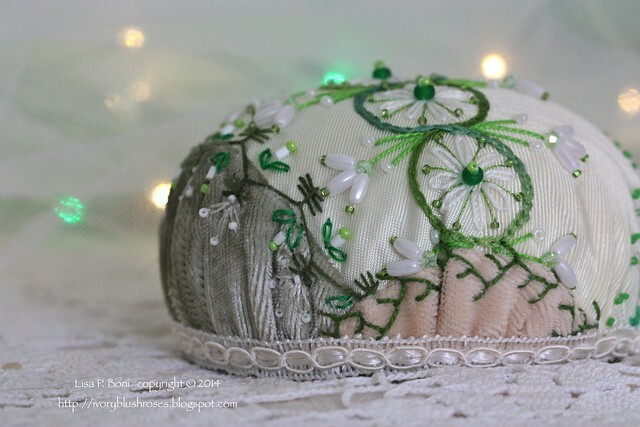 Have been loving your pincushion postings. What a lovely gift for some lucky reader! Beautiful meditation and beautiful photos. 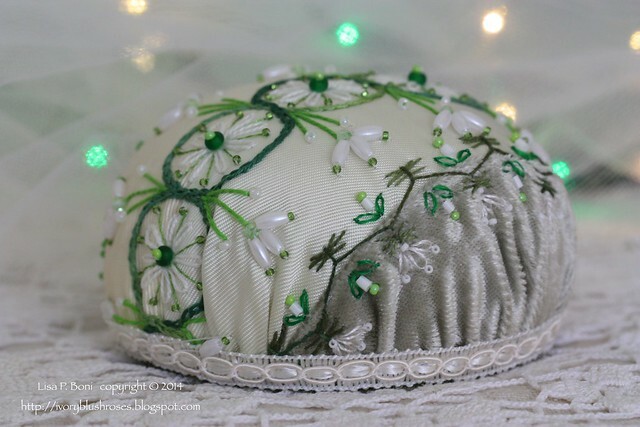 Beautiful pincushion. Hope to be a winner. Hi Lisa, I've enjoyed your Advent series this year. And naturally, I LOVE the pincushion! Have a warm and wonderful Christmas. 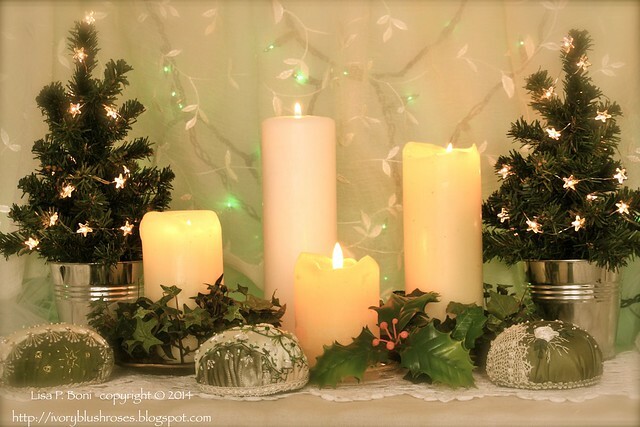 What a lovely idea for Advent Lisa! Count me in for the draw please! Loved your spiritually uplifting post this morning. Jesus is the Light of the world. Your latest pincushion is yet another beautiful creation of yours. I am looking forward to receiving mine. :-) Your exquisite work inspires me. Your pincushions are amazing. Thank you for sharing the reasons for the season in this way. Good start for a Monday morning. Thank you. Beautiful work as always! Thank you! 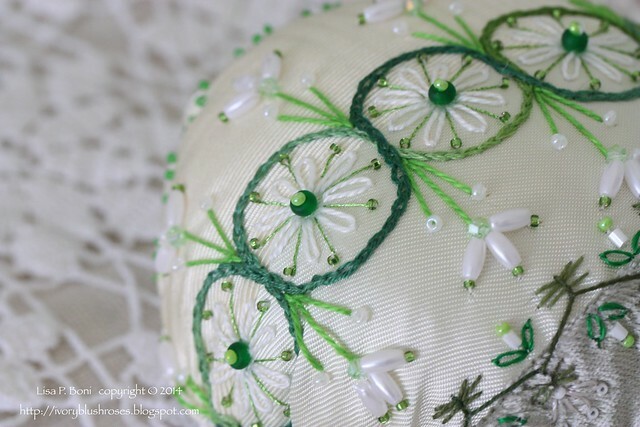 Another beautiful pincushion! Your blog has been a great encouragement to me this year, which has been a year of losses. I pray that 2015 will be a more joyful year, and even if it's not, I know Jesus is here. And that's all I need. Merry Christmas! So many encouraging and lovely words you send us, it's such a pleasure to see your magnificent work. May the Christmas Holiday bring you Love, Peace and Joy, and 2015 shower you with Good Health so you can continue to inspire us to become more humane and compassionate towards each other. Beautiful as always and so meaningful. Your work is inspiring. Merry Christmas and have a Blessed New Year. Beautiful pincushons. I have been folowing all of them. I so love your work. Thanks for sharing. 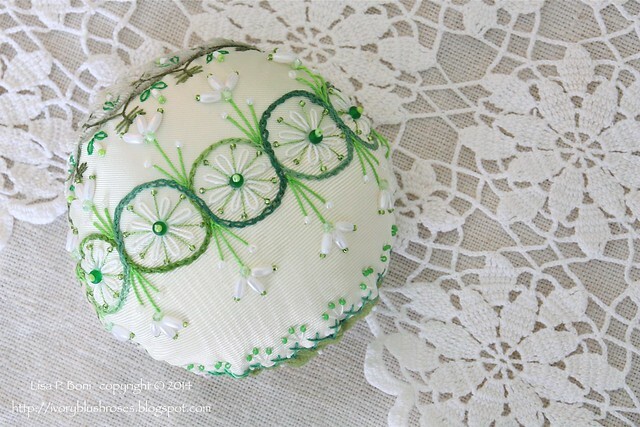 I really enjoy seeing all the variations you have created with your pincushions - they are endless and lovely. I especially like your new one with the green against the light background - a very elegant winter look. Merry Christmas Lisa to you and your family. We are back in Chicago for Christmas with our family. This is another gorgeous ones. You should go in the pincushion business. Merry Christmas! Another lovely piece of work. Thank you for taking the time each year to post such a wonderful message for the whole holiday season. I come to your site just to refocus on what the season is truly about. 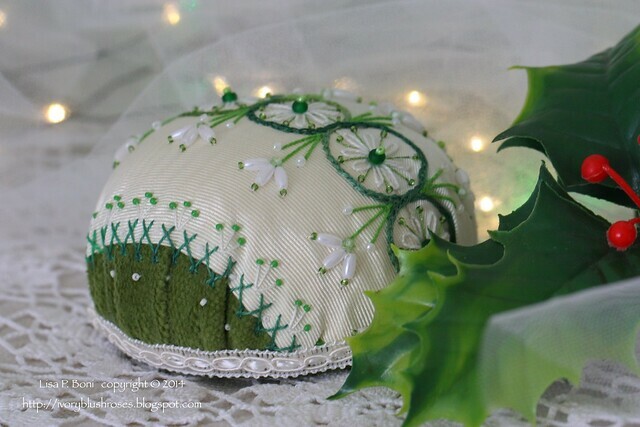 Beautiful picture, and lovely pincushion! Merry Christmas. All of your pin cushions are beautiful anyone would be lucky to have one. So inspiring, your work is simply stunning! Beautiful pincushions-all of them!